Brookfield's Cordova townhomes are priced from the high $200,000s. With a limited number of homes available at Cordova, buyers should move quickly. Brookfield has released the final phase of homes at its attached new-home community, Cordova at Windingwalk in Chula Vista. The builder also recently released its six models, three of which immediately sold. Homes at Cordova are priced from the high $200,000s. Two completed homes are available for immediate occupancy and include upgraded flooring at no additional cost to the buyer. Prices start at $301,900. Five homes are currently under construction and will be available for move-in during early fall. Prices start at $281,900. Three professionally decorated model homes are also available. The models-- all perched on a hillside with no across-the-street neighbors -- can be purchased with or without furniture. Prices start at $316,900. All residents at Cordova have access to a private recreation center, including a large pool, spa, barbecue area and changing rooms exclusively for Cordova residents. Cordova homeowners also have access to Windingwalk’s two private recreation centers and park, including the acclaimed WindingOaks Recreation Center equipped with a resort-style play pool, Junior Olympic lap swimming pool, and spa and locker rooms with restrooms and showers. WindingOaks also comes complete with a fully equipped gym, conference/meeting room, grassy play areas, a covered outdoor pavilion with exterior fireplace and barbecue, and a wedding garden featuring a wide lawn and covered gazebo. The park at Windingwalk includes a basketball court, ball fields, skateboard park and many other amenities. For more information about Cordova at Windingwalk in Chula Vista, visit the model homes at 1822 Casa Morro St. in Chula Vista or call 866-780-2303. Brookfield also offers Trellis, a neighborhood of detached homes at Windingwalk priced from $439,900. 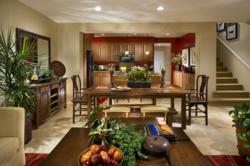 For additional details about Trellis, visit the model homes at 2346 Trellis St. in Chula Vista or call 888-520-3599. Brookfield Homes currently builds new homes in San Diego in the master-planned communities of The Foothills in Carlsbad, Windingwalk in Chula Vista, Stonebridge Estates east of Scripps Ranch in San Diego, and Old Creek Ranch new homes in San Marcos. The company also has significant land holdings in Riverside County. For more information about Brookfield communities, visit http://www.brookfieldsd.com. Brookfield Homes San Diego/Riverside is a homebuilding member of Brookfield Residential Properties, Inc. – a North American land developer and homebuilder, active in 10 principal markets. Brookfield Residential Properties Inc. entitles and develops land and builds homes for our own communities, as well as sells lots to third-party builders. Brookfield Residential Properties Inc. is co-listed on the New York and Toronto Stock Exchanges under the symbol BRP.